The Mercedes-Benz CLA compact sedan made a big splash when it first arrived as a 2014 model, complete with a much-discussed Super Bowl ad spot the previous year. The small, coupe-like sedan was built on the underpinnings of the smallest Mercedes on the market, the A-Class sold in Europe since the 1990s as a five-door hatchback. 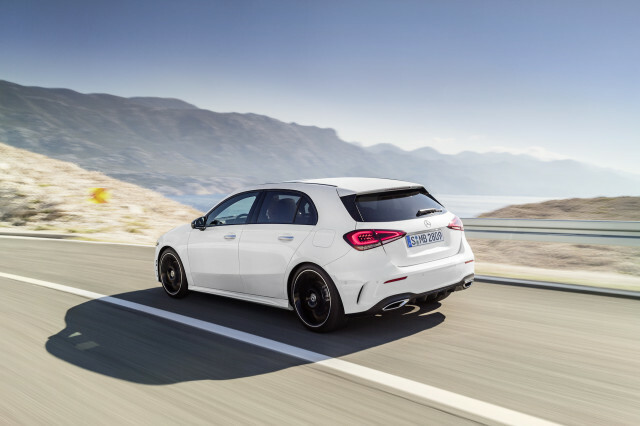 Last week, the company unveiled a new generation of the A-Class hatch, offering a sleeker design, more fuel-efficient powertrains, and a far more upscale interior that included the new MBUX infotainment system. 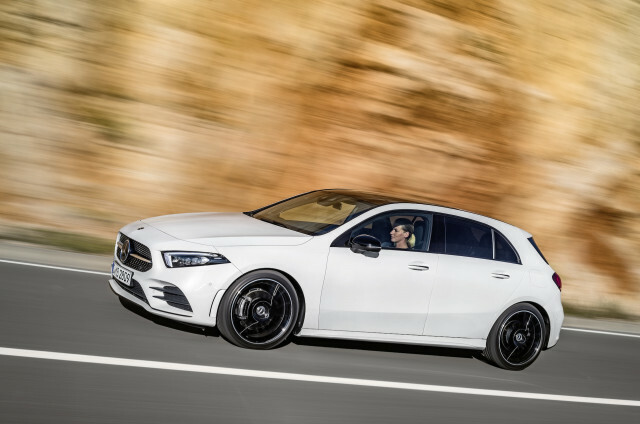 Consistent with the bracket creep affecting every new model these days, the updated A-Class has a longer wheelbase, and Mercedes says headroom, legroom, and shoulder room have all increased, as has cargo-bay storage. To give it a more aggressive or "athletic" look, the wheel arches have also gained 3 inches in width and its grille has a forward slant. Inside, though, there's a lot more S-Class than in the previous version, most notably in the array of choices for digital dashboard displays. The overall interface now has a name—Mercedes-Benz User Experience, or MBUX—and comes in three versions: two 7.0-inch displays, one 7.0-inch and one 10.25-inch display, or two 10.25-inch displays. As in the much larger, pricier, and more prestigious S-Class, the updated A-Class splits the function of the two dash displays. The one behind the steering wheel is largely a virtual gauge cluster, with driver-selectable options for the operating information that can be displayed. The more central screen, where a second one is fitted, handles typical infotainment features, including the audio system, connectivity with various devices, and less immediate operating information. One of the added features is an artificial-intelligence system that interprets voice commands, including such natural-language statements as, "Mercedes, I'm too hot," which will lead it to lower the cabin temperature. Drivers can tell the system they're hungry, and it will offer an array of nearby restaurants, including reviews on Yelp or other rating sites. In a test of an early system, it appeared to work well. The A-Class may be small, but it's added numerous features from more high-end Mercedes models, including options like massaging seats with heating and cooling, LED performance headlights, and a full array of active-safety systems. The new A-Class will offer European buyers three engines. Two are gasoline—at 1.4 or 2.0 liters—and a 1.5-liter turbodiesel will also be offered, with either a 7-speed dual-clutch transmission or a 6-speed manual gearbox available. U.S. models of the future updated CLA will likely use only the larger gasoline engine and the DCT. All-wheel drive and an active-damping suspension will be optional, and undoubtedly there will be Mercedes-AMG performance versions as well. Other vehicles for various global markets to be built on the A-Class platform include a GLA small crossover utility vehicle, a so-called rugged SUV to be called the GLB, and the EQA battery-electric car—for which a concept version was shown last September at the Frankfurt auto show. That car used a 60-kilowatt-hour lithium-ion battery to power one electric motor on each axle, giving a combined 200-kilowatt (270-horsepower) power rating and 368 pound-feet of torque. Mercedes cited a 0-to-62-mph acceleration time of about 5.0 seconds for the future EQA, which is expected to hit the market in 2020 or so.